This TAYLOR - LIVERPOOL 5-string banjo has a very ingenious built in capo. It converts the regular banjo into a piccolo banjo, one octave higher. At the 12th fret there is a brass bar with slots for the strings inlayed flush with the fingerboard. There is a separate hook for the fifth string on the 17th fret. The whole shebang is spring loaded with a lever at the back of the neck. When pressed it raises the brass bar to permit the strings to be hooked into the slots. When the spring is released the strings are held in position at the 12th and 17th fret. This photocopy shows the fretboard of a regular 5-string banjo with metal attachments permanently inlayed and fastened with screws at the 7th and 12th fret. When the strings are slipped under the tongues in the plates, the banjo is converted into a banjeaurine. Made by Windsor & Taylor in England around 1900. Tom Nechville designed this built in banjo capo system. 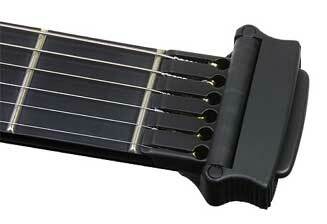 The neck has flush mounted recessed tracks running the entire length of the fingerboard on each side. The main rolling capo and a separate 5th string capo run within these tracks and can be stationed behind the nut when not in use. 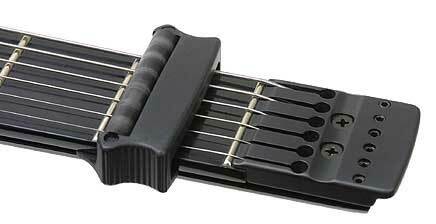 Either capo part is used by simply pulling it up to any of the 22 frets. The fifth string is extended all the way to the nut, making it possible to capo the fifth string below the fifth fret. Ned Steinberger designed this electric guitar with an integrated capo. As there are no tuning pegs at this end of the guitar, the capo rests comfortably above the zero fret without interfering with the hand.